iRelaunch has worked with thousands of "relaunchers" on their road to career reentry. We've identified the shortcuts, exposed the roadblocks, and mapped out the most efficient and successful approach. Carol Fishman Cohen, iRelaunch CEO and Co-founder literally "wrote the book" on career re-entry. Carol and the iRelaunch coaching team are internationally known experts in returning to work after a career break. Everything in the Return to Work Roadmap is based on quantified research and results. Exercises, podcasts, videos, and worksheets are the results of our research and coaching work with relaunchers just like you. NOT READY? TRY THE FIRST STEP FREE! Our unique 5-Phase approach guides you through every step of the process. From thinking about a job to finding the right one for you. The iRelaunch Roadmap allows you to determine what steps are best for your unique needs. Your Roadmap also includes everything in our Relaunch Starter Kit: our proprietary Relaunch Readiness Assessment, an invitation to join our PRIVATE Facebook Group, and access to our Success Story Gallery - including hundreds of tips for networking, confidence building and more. Order the iRelaunch Return-to-Work Roadmap now. Take your free first Step today! We'll show you the way back to work. If you're thinking about returning to work, there are plenty of things you can do to keep you at the top of your game. 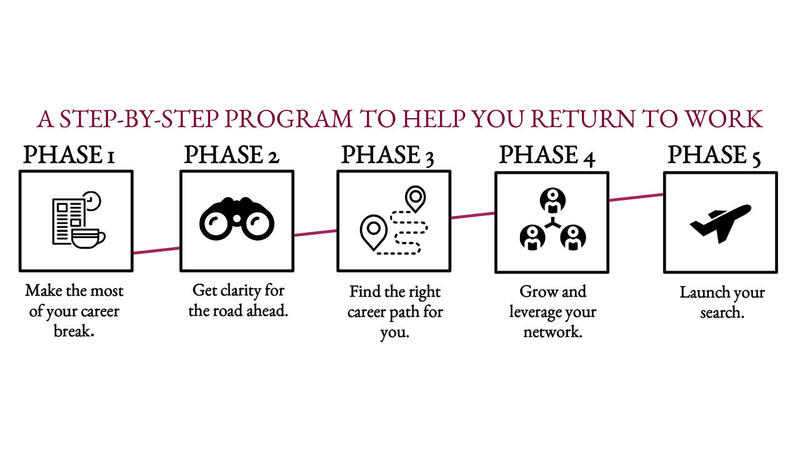 Phase 1 shows you how to reconnect personally and professionally, maintain momentum through Lean In Circles, Relaunch Buddies, and the iRelaunch Return to Work Community Forum, and shows you how to stay relevant during your break. Phase 2 is a time for self-definition and finding clarity for the road ahead. First, you'll assessing your readiness to relaunch. Next you'll learn how to rebuild your confidence and understand your work values. Cap it off with our "3Cs + 1 of Relaunching" exercise and your road ahead becomes clear. What's the best job for YOU? In this Phase, you'll map the key functions for your ideal job and build your new career path based on the personal career exploration you completed in previous steps. At the end of this Phase, you'll determine your career exploration goals for the next 30 days. Many studies show that networking is still the best way to find a job. 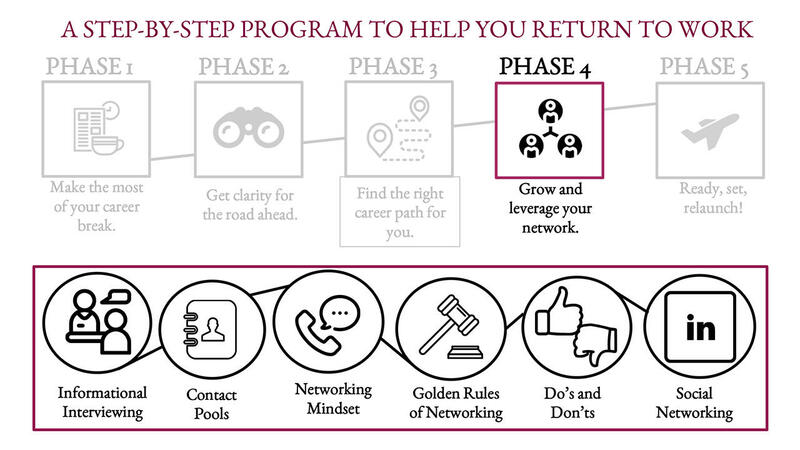 In Phase 4 you'll build and activate your contact pools, learn the do's and don'ts of networking, and informational interviews. You'll also discover why LinkedIn is a gift to relaunchers. Phase 5: Launch your search! Now you're ready to get into the nuts and bolts of applying for the job and getting the offer! Phase 5 covers using social media to research potential employers, the elevator pitch, cover letters and resumes (including when and how to describe career-break activities) and LinkedIn profiles. We'll share some secrets about tricky interview questions (and how to ace them). We'll also cover salary negotiation. You're ready to take that important first Step - so let's do it together! We'll give you all the tools you need along the way. "I am LOVING the Roadmap and am only on Phase 1! I have listened to the first podcast, read the article and have downloaded the 3, 2, 1, (podcast) series to my iPhone. I made 6.5 pages of notes from that first podcast alone! I shared the course info with my friend in California who then signed up for the Roadmap course too, and we will be forming a group to help support each other. I felt insecure about the big gap in my resume. I also felt very alone in these feelings. NOW I feel connected and excited about all the possibilities." 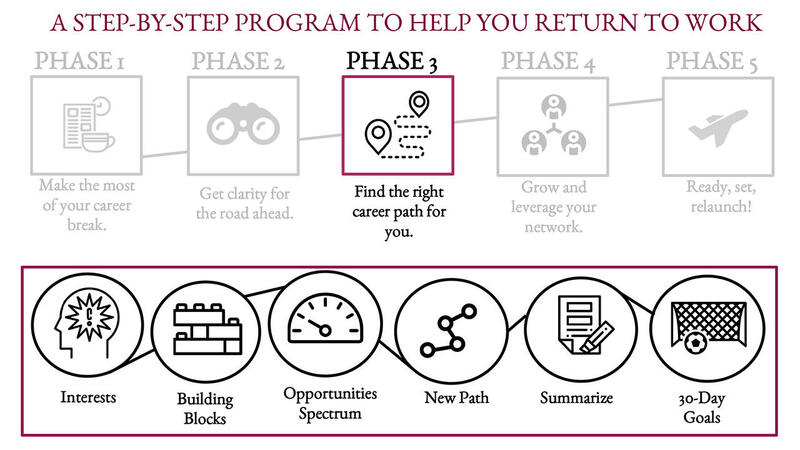 "The phases and steps display the years of work that Carol Fishman Cohen and the iRelaunch team have put into researching this unique career challenge...the Roadmap enables the relauncher to quickly get up to speed with access to a wealth of resources. 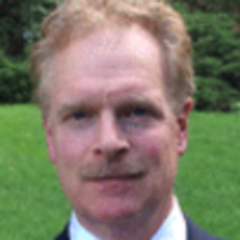 Allowing the career relauncher to go through this process on-line at his/her own pace and availability is brilliant." "You stand as a source of endless inspiration to me personally and I am so grateful to have had the opportunity to meet you at a time when I was ready to take the necessary steps to relaunch myself. What you did for me, and for so many others, is so powerful and life changing. I know you hear it every day of the week, but what you have provided through iRelaunch is an invitation to those who stepped away from professional life to reopen that door and to walk through it with a renewed sense of purpose, commitment and confidence with which to meet the future. -- from successful relauncher who relaunched after a 17 year career break"
"iRelaunch organized me, inspired me, and provided excellent networking opportunities. With the dizzying array of resources available to the job seeker, your program cut through the excess of information and created an effective template for me to follow. I’m grateful that a friend recommended irelaunch to me a few years ago and look forward to referring my peers to you as they enter their relaunch journey." What is the format of the Roadmap? If you've ever taken an online course, this is a similar format. If you haven't, it's very easy to navigate. You simply log in, and you immediately have access to all 5 phases (over 30 steps). 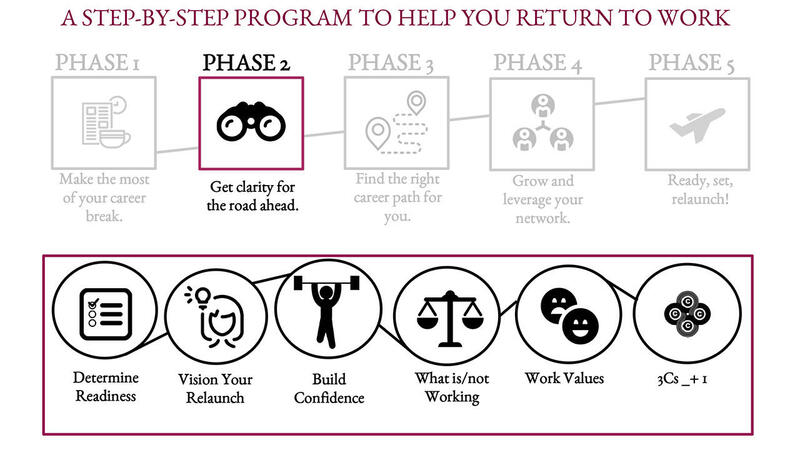 Ideally, you would start at Phase 1 Step 1, but it depends a bit on where you are in your relaunch journey. The product provides flexibility to jump around as needed, as you have access to all the content at once. You can easily leave the product and come back any time - it is yours to access when the time is right for you. How long will it take me to complete all phases and steps on the iRelaunch Roadmap? The self-paced design of the Roadmap allows you to complete the steps according to your schedule. We recommend that you try to complete three Steps each week. With that timing, you should complete the entire course within three months. Of course, you can complete more Steps if you prefer, or you can go straight to the Steps that feel best address your return-to-work needs. How should I navigate the Roadmap? If you have the time, we recommend you take a look at each phase of the Roadmap in order. 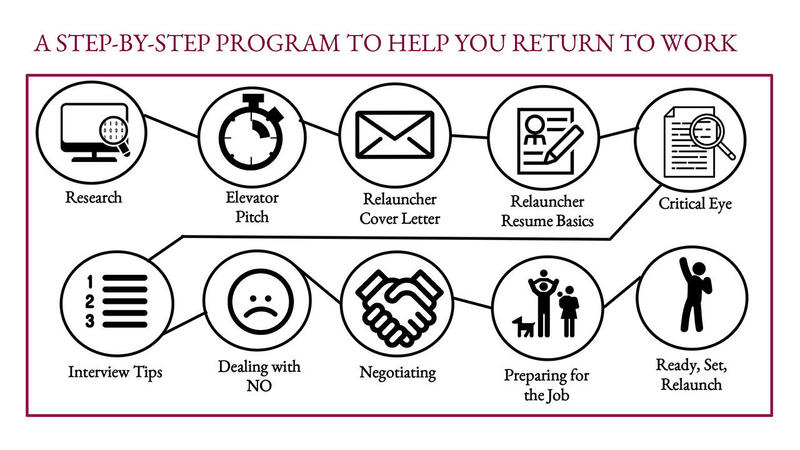 iRelaunch experience has shown that crucial steps are often overlooked when returning to work, including determining the best job for you and steps you can take to improve the likelihood of not just getting an interview ... but getting an offer. The product is built so that you can work through one step at your own pace, and then you click “next” and move onto the next step (and the first step is marked complete). You can always go forward or backward as needed. But what if I only need certain aspects of the program? Just like any roadmap, the journey starts with your current location and offers lots of different routes. That's the beauty of the iRelaunch Return to Work Roadmap. Regardless of where you are or what you want to focus on, you'll find it here. Take a moment to look at each phase and the Steps along the way. Then you can tailor the program to meet your current needs. Can I access it when I'm not online? While you do need to be on the Internet to access the product, there are a lot of worksheets and other materials that are downloadable, so it’s easy to take those with you / print them out / use them while offline. What types of materials should I expect in the Roadmap steps? A series of (typically between 3 and 5) actions to take to complete the Step. For example, “listen to this podcast on salary negotiation” or “download and complete the attached contact pools worksheet," or “identify 5 networking contacts you will reach out to this week." A video guiding you through specific parts of the Step. For example, the tools we offer in the Roadmap to help you build a visual map of your ideal next job are a series of worksheets - this particular Step has a video featuring our CEO to guide you through how to fill out the worksheets and make sense of the final map. Please reach out to us at [email protected] and we will be happy to help! You're on the road back to work! And we're with you every step of the way. Let's get started! 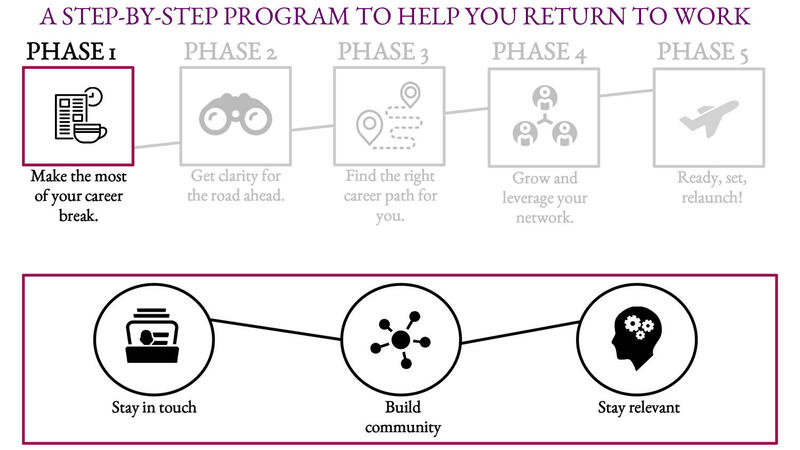 Fill out the form below and you'll be taken directly to Step 1 on iRelaunch Return to Work Roadmap. Be sure to bring something to take notes on ... you're going to learn a LOT on this step!